94% of the Croats believe that corruption is widespread in their country. This is well above the EU average (76%). More than half of the respondents in the 2013 Eurobarometer poll say that corruption affects their lives daily. The EU average is 26%. 89 percent had stated that bribe and favouritism often are the easiest way to get certain services in Croatia. The EU average is 73 percent. In the meantime, just a few Croats state that they were required to or were expected to offer a bribe in the past 12 months. With these results Croatia lines up with the countries where the perception of corruption is the highest - in one group with the Czech Republic, Lithuania, Bulgaria, Romania and Greece, according to the first of its kind report of the European Commission on corruption in the member states, published in the beginning of February. Croatia finds itself in a very interesting position of a country which is on its way upward to join the group of countries that do better in the fight against corruption, but still is among those where corruption is a major problem. In the same time, it is among the few countries whose good practises in the fight against corruption are quoted in the report. Bulgaria, for instance, is entirely absent from the list of countries whose good practises are being recommended. Nonetheless, the Eurobarometer data is striking. 81% (with EU average of 73%) of Croatian businesses believe that favouritism and corruption hamper competition in the country. In the report, the European Commission says also that organised crime represents a serous challenge for Croatia and that corruption serves as a facilitator in this context. Cases of deliveries crossing the border without checks are quoted or crime money laundered by being reinvested in real estate. Also quoted is a study which estimates that the size of the grey economy in Croatia is 29.5% of the country's gross domestic product. The problem is additionally complicated by Croatia's geographic position, situated along the "Balkan axis" of traffic of humans and goods. In this regard, Croatia is rather a transit country than a country of origin. Another unpleasant fact outlined in the report is that in spite of the existence of appropriate legislation, the mechanisms to check public officials' wealth and assets have not proved efficient yet. Also a problem is the regular replacement of mid-level staff in the administration with every change of government, which creates a climate of instability and contributes to public attitudes that one can work in the public administration only if they have connections or on the basis of party merits. In spite of the bad results, though, in the report of the Commission some good examples are quoted from Croatia. One is the specialised Bureau for the fight against corruption and organised crime (USKOK), attached to the chief prosecutor's offic. The Commission finds its work, under the leadership of Dinko Cvitan, very good. The Bureau has a long track record of proactive investigations and successful prosecutions, including against high level elected or appointed officials. The highest of whom is former Croatian PM Ivo Sanader, who is currently serving a ten-year prison sentence for misuse of public funds. This is the first time such a high level official is sent to prison in the Balkans. Sanader is also the first ex-premier found guilty for corruption. The Zagreb district court sentenced him to 9 years in prison and to pay back nearly 3 million euros of embezzlement money in the biggest corruption trial in the country, Fimi Media. Along with him, on corruption charges has been sentenced the first political party - Croatian Democratic Union (HDZ). The European Commission report quotes another good example from Croatia - the electronic database for public procurement. It has worked for a year now thanks to a non-governmental organisation which developed a project funded with EU money. The database gathers together information about public procurement procedures and the companies that participate in them. The website contains also formation about assets and interests of public officials in compliance with the personal data rules. There is also a possibility to make cross checks. The data are accessible to the public for free. Croatia, together with Portugal and Slovenia, is pointed in the report as a country with good practises in terms of public procurement. How does Croatia see the report and itself? In 2011, a study by the United Nations Office on Drugs and Crime showed that the Croatian citizens rate corruption as the third important issue in their country. According to Dragan Zelic, executive director of the non-governmental organisation GONG, however, fight against corruption does not seem to be a priority for the Zoran Milanovic's government. That fight against corruption is an important priority for the society speaks the fact that just days after the report was presented, in Zagreb, a very interesting discussion took place about the report, organised by the European Commission representation in the Croatian capital, in which key figures took part like Dinko Cvitan, USKOK's director, who was several days ago elected chief prosecutor. In addition, part in the discussion took Dragan Zelic, whose non-governmental organisation is very active in balancing the public interest, and Davorka Budimir, the president of Transparency International in Croatia. 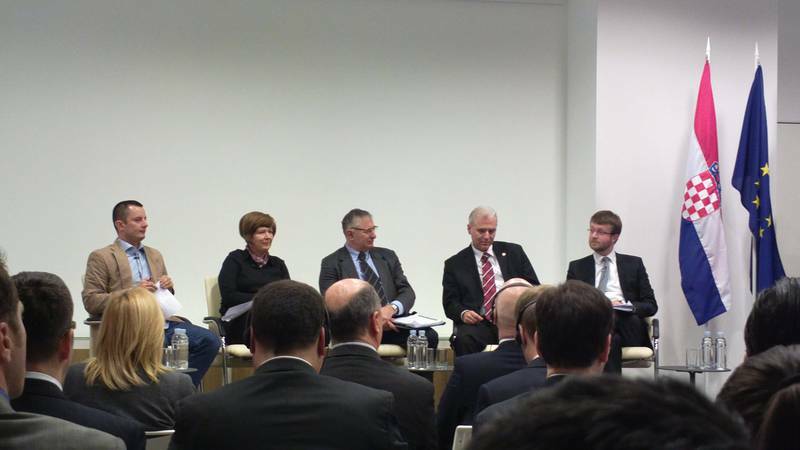 Moderator of the discussion was Josip Kregar, member of parliament. Kregar is elected from the ruling Social Democratic Party (SDP) and chairs the justice committee in the Sabor (the parliament). In his words, corruption is a result of bad governance and lack of confidence. According to him, political responsibility cannot be sought only every four years, meaning only during elections. He also said something very important - that in Croatia there are good laws, but not deeply rooted values. Dinko Cvitan was happy with the report, but emphasised that the biggest problem in the fight against corruption, especially at the high levels, is the collection of evidence. Moreover, USKOK is often subjected to strong media pressure for quick sentences, but, in fact, often cases are big 200 000 pages that have to be carefully read and analysed. The biggest challenge, he said, is the fight against corruption at local level. This is so because media at local level are very weak, Dragan Zelic told him, adding that Croatia is a young democracy which is still in the process of institution building. Dinko Cvitan added that the other very difficult level in the fight against corruption is public procurement. Very often, he said, those who failed in competitions expect to be "rewarded" at the next competition which is why they are not inclined to "blow the whistle" for irregularities. Unless witnesses speak out corruption cases will remain unresolved. Regarding whistleblowers (people who reveal information they learnt in the course of their work), during the discussion a serious drama unfolded. Vesna Balenovic addressed the audience. She is founder and chairwoman of the Whistleblower NGO. Her personal story is worth a Hollywood movie and caused reactions along the entire emotional spectrum - from scoffing to glorification. She was disappointed that she was not invited as a participant in the discussion and said she was still struggling with the consequences of her decision to blow the whistle which led to losing her job. She also told stories from her personal life which sounded more like a conspiracy. At the moment, in Croatian pyblic domain, there is a debate on the first Croatian law on protection of whistleblowers which also got the support of the country's President Ivo Josipovic. At a discussion on the issue in the end of February, he said: "Whistleblowers, citizens who reveal irregularities and corruption, deserve special treatment and protection. Regretfully, practise shows that many of them are subjected to pressure, doubts, there are no adequate mechanisms for protection". One of the weak spots in the Croatian legislation, according to the European Commission report, is the law on prevention of conflict of interest. The main criticism is against the limited sanctions it foresees. In the report, it is pointed out that there were many amendments and appeals against the law as well as the powers of the commission on prevention of conflict of interest, deemed weak in this regard. Dragan Zelic also criticised the work of the commission pointing out that the conflict of interest, by definition, is not corruption but it creates conditions for corruption. Davorka Budimir also shares the European Commission's view that the commission on conflict of interest is limited in its work. She raised the issue about the definition of a "public official" - a problem which is described in much detail in the report. Moreover, the Commission says that the lack of a harmonised definition of "public official" at EU level is "a fundamental challenge" in the fight against corruption. In 2012, the Commission proposed a directive for protection from fraud and crimes against the EU's financial interests. 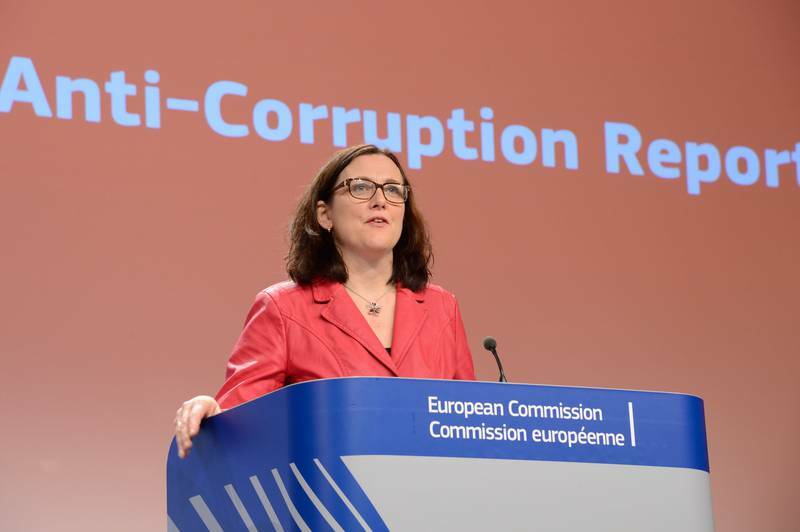 The negotiations in the Council and the European Parliament, though, according to the Commission, demonstrated a lack of support for the proposed definition the aim of which is to criminalise corruption committed by elected officials. Both Ms Budimir and Mr Zelic spoke about the need of public online registers which could have prevented all those corruption scandals. The most important thing, however, is the political parties to create mechanisms to purge themselves and not to allow at their highest levels people who do not understand basic moral standards. There are several conclusions that come to mind from the report on Croatia and the discussion it provoked. The most important of them is that, obviously, Croatia does not like the place it is in in terms of corruption. Another very important conclusion is that Croatia is sensibly better compared to Bulgaria and Romania, for example, because its preparation for EU accession was much more serious precisely because of the experience with these two countries. The anti-corruption report is based on the experience with the Cooperation and Verification Mechanism (CVM) which Romania and Bulgaria joined the EU with half-prepared on January 1st, 2007. 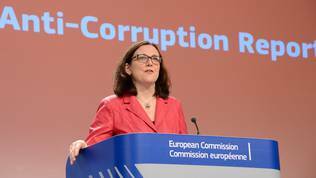 It is explicitly stated that when the CVM ends, the European Commission anti-corruption report will continue to monitor the two countries' progress in the area of fight against corruption. And as regards Croatia, the successor of Dinko Cvitan as USKOK chief will clearly show which path the country has chosen. The fact that he was elected chief prosecutor proves, practically, Zoran Milanovic's claims that he wants to impose the rule of law in Croatia, because Mr Cvitan has a perfect CV and I was left with the impression during the discussion in the House of Europe in Zagreb that he is a man who is completely intolerant toward violation of law and, what is more important, to the lack of moral in politics. It is the chief prosecutor who will appoint the director of USKOK, so it could be expected that he will find a successor who will continue his work of a relentless opponent of corruption and organised crime. But as Josip Kregar put it in the beginning of the discussion, the Commission assesses results not intentions.